An entire 232-page book on one 19-verse Psalm? If that sounds unbearably dull then you may be surprised. 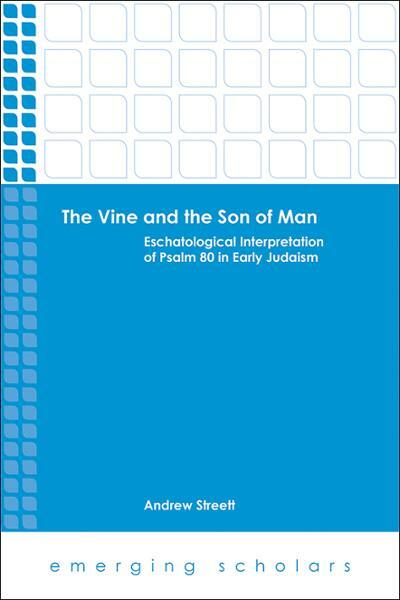 The Vine and the Son of Man – Andrew Streett’s revised doctoral dissertation reproduced through Fortress Press’ Emerging Scholars series – is a prime example of the cornucopia of fruits one can reap from a close and careful study of the Word. Streett plumbs the depths of the oft-overlooked Psalm 80, paying a close attention to how it became interpreted eschatologically and messianically in the completed Psalter, the OT, Second Temple literature, and the NT. Despite Psalm 80 never being directly quoted in the New Testament, Streett argues that it played a significant role in the messianic hope as well as in Jesus’s self-understanding and teachings; though never quoted, it does lie behind a number of NT texts. Jennifer Guo provides an excellent summary of the book in her review, so I will direct my readers there for a fuller overview while I get straight to business. Streett works in a logical manner, beginning with interpreting Psalm 80 in its original context (chapter 1), its relationship to other Psalms in the completed Psalter (chapter 2), its relationship to Daniel 7 (chapter 3), its interpretation and use in Second Temple literature (chapter 4), its use throughout Mark’s passion predictions (chapter 5), its use in the parable of the Wicked Tenants (chapter 6), and its use in Jesus’s true vine teachings in John 15:1-8 (chapter 7). This common sense, clear and calculated approach is a good representation of the entirety of The Vine and the Son of Man; Streett faithfully guides the reader through his argumentation with summaries, conclusions, and reviews throughout. Streett begins by approaching Psalm 80 on its own terms. He argues that Psalm 80 was lamenting the Northern Kingdom’s destruction in the late eighth century BC and “[reminding] Yahweh of God’s [sic] former blessing on the twelve tribes and to plead for restoration through the leadership of a Davidic king” (p46). He highlights exodus/new exodus and creation/new creation themes present in the psalm and the emphasis on the king as God’s instrument for restoration. These themes prove as fertile ground for later eschatological interpretation. My understanding of the psalm before and after reading this chapter was radically different; the psalm is rich and this chapter brings out the many flavours. Though I appreciated that Streett took a minimalistic view on Psalm 80’s redaction history, I remain (perhaps naively?) unconvinced by his arguments that v15b is a later addition to the psalm; I don’t see why the conclusion is necessitated. Though it is not a major part of his argument it is reiterated throughout the book. For a book dedicated to a single Psalm, one could be surprised with how wide-reaching The Vine and the Son of Man really is. Streett’s study hits on a number of significant topics: the editing of the Psalter and the identity of Daniel 7’s (infamously debated) son of man figure being two worthy of note. Chapter two has an excellent survey of and argument for an intentional design to the Psalter that reflects and emphasizes the messianic hope. The messianic flavour of Psalm 80 is only enhanced by its interaction with other Psalms, particularly Psalm 89. As to Daniel 7, Streett argues that Ps. 80 “provides the basic structure and the major images of the vision” (p107) before boldly approaching the interpretative beast that is Dan 7’s son of man. Streett concludes that, seen through the lens of Ps. 80, the son of man is “an exalted royal leader who plays the role of Adam as king and priest over a renewed nation and creation” (p114). This is a man after my own heart! The debates surrounding Daniel’s son of man are intense, with many taking “him” as merely a symbol for Israel, but I believe Streett presents a compelling case for seeing him as a messianic individual who is closely related to his people. As if the rewarding content on the Psalter and Daniel 7 wasn’t enough, the heart of the book lies in the New Testament material. There is a comprehensive study on Mark’s passion predictions (Mark 8:31; 9:9-12; 9:31; 10:33-34) that presents seeing Psalm 80 as a foundational text solves the problem of “how the Son of Man is associated with suffering and resurrection” (p161), something that the usual proposals (Isa 50; 53; Ps 118:22; Hos 6:2; Dan 7) do not do. This section, the Wicked Tenants, and Jesus’ “true vine” saying in John are all equally strong and worthy of close attention. A virtue in Streett’s work is his careful representation of other views and level-headedness in giving his own. His summaries of scholarly opinion were easy to follow, charitable, and free of condescension or hyperbole. When it comes to his own work, Street is unafraid of laying all the options on the table, but is also reasonable and doesn’t overreach in his conclusions. His writing is clear and easy to follow, particularly for a rigorous academic work; his writing simplifies some tricky concepts and proves that robust scholarship need not require equivalently opaque prose. Lest I seem overtaken by praise, I will offer a few minor critiques. Some might defend Street and consider it wise restraint on his part, but I wish that he had gone one step further by providing broader implications of his study and attempting more synthesis. A good example of Streett doing this very thing is in his section of the identity of the son of man in Dan 7, but I would have liked him to address more areas, such as the messianic hope in the OT (and the doubters), and whether his study affects a preterist interpretation of Mark 13 and 14:62, seeing as how they draw on a Dan 7 background. I believe Streett overstates the situation when, after surveying how the psalm is interpreted throughout OT and NT, he concludes, “[it] is difficult to imagine a more variegated group of interpretations” (p225). Throughout the book, Streett implies that the various interpretations of Psalm 80 do not reflect the intent of the original author, but that the author’s occasional vagueness of language was used to make different points. If this is what Streett means by his above quote, then I would disagree. For one, I do not see why the later eschatological and messianic meanings could not have been present in the original psalter’s intention in seed form. Granting the original background as being the Northern Kingdom’s destruction, why could the petition not reflect a messianic hope, as the messiah is (amongst other things) God’s ultimate king? Why not hope that this king fulfill that role? In other words, I don’t see the same amount of variance from the psalm’s original setting to how it is later interpreted as Streett does. Again, this criticism is relatively minor. Lastly, readers may be confused by the verse numbering since Streett gives no explanatory note that he is using the Hebrew numbering for Psalm 80 (more info), resulting in all references being “one off” from the English. For example, the son of man is found in verse 17 of English Bibles, but is labelled as verse 18 in The Vine and the Son of Man. This follows usual academic practice but requires a constant mental note for those reading along. Another quirk is that many footnotes find themselves on the bottom of the following page. For example, the last sentence on page 12 refers to footnote 51, which actually appears on page 13. I raise this to warn potential readers. This is a truly wide-ranging and deeply-researched work, both of which would be impressive enough, but what’s more striking is that Streett has done it all so well. He has broken new territory by providing something unique: recovering a somewhat overlooked, even ignored, Psalm that is surprisingly rich in messianic and intertextual details. This is a recommended read for all serious students, particularly those of Christology, Messiah studies, the NT use of the OT, and Biblical Theology. The Vine and the Son of Man fills a gap many didn’t know existed, and I hope and expect that it will have a lasting impact on scholarship and the church.